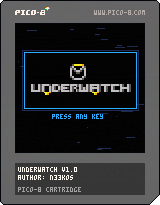 Underwatch is an objective based team shooter demake coded in Lua. The objective is to capture the control point (marked in orange) by ensuring that only your teammates are occupying the area. You must eliminate your enemies and raise your team's capture meter to 100% before the other team does!